Following the gripping and truly emotional novel The Glass Prison in which Bernice’s character and strength of will is pushed to its limits as she gives birth via C-section to her half-human and half-Killoran son Peter Guy Summerfield, the third series of Big Finish’s audio adventures featuring the renowned archaeologist begins with ‘The Greatest Shop in the Galaxy’ by Paul Ebbs. Under the auspices of investigating the famed Latrines of Baladroon on Sirius One Bee, Bernice can’t help but take a diversionary trip to the Gigamarket’s impressive shoe section, but an uneasy peace maintained by a force wall and time itself seem to be in imminent danger of breaking down as her shopping exploits begin, a threat much more dangerous that that seemingly posed by the vegan terrorists who don’t agree with the sale of shoes. 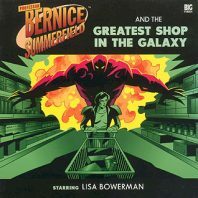 With a clever spin on the Sylvester McCoy serial title, ‘The Greatest Shop in the Galaxy’ is filled with strong ideas and a certain flare and style that better recapture the highs of the first series of Bernice Summerfield audio adventures. The premise of a superstore holding everything imaginable where the nearest cash registers are days apart by foot is a fascinating- if somewhat superfluous- concept for the wider Doctor Who universe, but it’s the uneasy truce between the humans and the more carnivorous Borvali that forms the emotional crux even as Bernice breaks down following her recent harrowing events to justify her more frivolous desires with Adrian’s credit chip in hand. This may just be the best representation of Bernice in Big Finish’s original audio stories yet, and the hints of the relationship she has with Adrian who has set his chip to lukewarm upon realising Bernice took it as well as with her robotic sidekick Joseph who continues to try to sell her upgrades further enhance the mythology surrounding this character who is so fiercely intelligent and determined to piece together the dark mystery that soon rears its head as first symbolised by her beloved shoes staggeringly turning back into cows. As a slaughter suddenly ensues, Bernice and her important contact on this world, Keelor, find themselves rescued by a group of soldiers from a century in this planet’s past when the humans and Borvali were at the height of war. Understanding the nuances of time travel and that gaining trust is paramount when Keelor’s own grandfather is found to be leading this group, Bernice asks Keelor to tell Tarband something only he could know, but his decision to reveal the circumstances of his grandfather’s death isn’t exactly what she had in mind. Yet it’s this collision of two times that exposes the very worst of Keelor that lurks beneath his congenial demeanour, a man who has given into the allure of capitalism with his Gigamarket to make a profit off of the untapped consumer potential that the Borvali and their desire for human meat represents, and David Benson plays both sides of this dichotomy engrossingly. There is utterly no redemption for this man in the eyes of Bernice from the present and his grandfather from the past who are repulsed in equal measure by his willingness to work with the enemy his grandfather fought so hard against and to sacrifice innocent lives for a tidy profit. While it’s wholly unsurprising that Keelor and Tarband together end up representing the literal manifestation of the grandfather paradox as their ideals clash and the truth behind this peace becomes known, it provides a very interesting solution to the dilemma and represents just one example of how everything introduced has a very specific purpose that receives adequate payoff by story’s end. ‘The Greatest Shop in the Galaxy’ may not be the most cutting-edge or unique story ever told, but it is immensely confident and cohesive and features immense performances that make it a distinct standout and a perfect example of what this audio range can deliver when meshing the bizarre with true horror.